The Karthspire is a cavern in the Karthspire mountain at the southern end of the Karth River valley. It is occupied by Forsworn, who have also made camp outside. 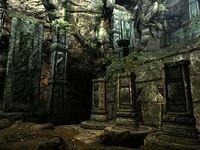 There is only one zone, but it is split into the Forsworn occupied camp, and the booby-trapped puzzles that lead to Sky Haven Temple, which can only be accessed once you have started the related quest. If you fast travel to Sky Haven Temple after discovering it, you will land inside this cave, in front of the blood seal and door to the temple. 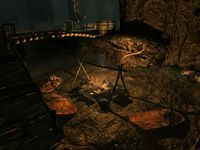 Outside the cave is a Forsworn camp, see here for full details. At the top of the stairs are three rotatable pillars with unusual symbols on them. Unless you are here as part of the Alduin's Wall quest, or have already completed it this is as far as you can go. During this quest you unlock the stone bridge and cause it to drop into place allowing further progress to be made. There is a second juniper tree on the far side of the bridge and stairs leading south into a tunnel. The tunnel turns to the west again and open into a room full of pressure plate tiles on the floor. Follow the correct symbols to the pull chain that deactivates the traps and drops a second bridge over the previous large open roofed cavern, heading north. As you cross the second stone bridge there is another juniper tree on your right on a lower ledge only accessible by dropping down onto it. There is nothing else of interest there. Continue to follow the path into another tunnel that turns to the west and up some more steps. It then turns south again and you are now at the highest level within the large open roofed cavern. The path forward heads west and opens out into a large stone chamber with an unlocked chest in the middle and a quicksilver ore vein. This is the entrance to Sky Haven Temple. You need to activate the blood seal to gain entrance. 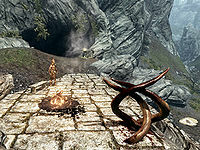 Although it is not clearable, the Forsworn and all items, including ore veins inside the cave do not respawn. The chest in front of the blood seal is safe, and is directly in front of the spawn point when fast traveling.